"Princes and lords may flourish, or may fade; /A breath can make them, as a breath has made; /But a bold peasantry, their country's pride, /When once destroyed, can never be supplied". -- Oliver Goldsmith, "The Deserted Village"
Small farmers are the key to ending poverty and hunger and promoting sustainable development. In India, small and marginal farmers — those who work on less than two hectares (five acres) of land — constitute 80% of all farm households, 50% of rural households and 36% of the total of all households. Sadly, the plight of these farmers is very distressing. Agricultural productivity levels have been stagnant for the past 10 to 15 years. An estimated 70% of the country’s arable land is prone to drought, 12% to floods, and 8% to cyclones. India’s top policy think tank, NITI Aayog, recently found that the agricultural sector is 28 years behind in its expected development. Small farmers have little access to technology, and inconsistent access to irrigation, making them one of the most vulnerable groups to future climate change. Farming for them is grindingly physical work. Families plant, pick, harvest and haul by hand, with each new generation dividing up what they have into ever smaller plots of land. The question should be why almost 55% of the population produces just 15% of agricultural output. Unless this huge swathe of the population is empowered, loan waivers will remain a recurring feature of the landscape. One major challenge the farmers face is their limited access to markets: more than 75% of the final revenue goes to middlemen rather than the farmer. 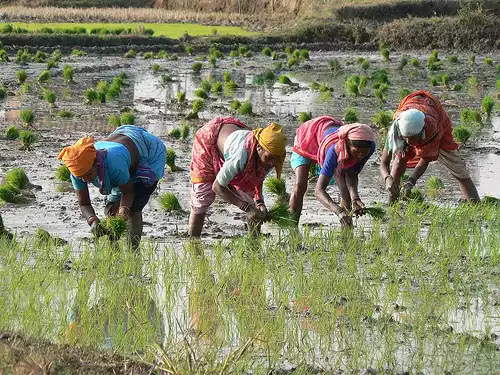 According to the 70th Situation of Agricultural Households in India, conducted by National Sample Survey Office (NSSO), 90% of India’s farmers have less than two hectares of land. The survey says the average farm household makes less than Rs 6,500 a month from all sources of income. These farmers are only kept afloat by government financial and by the periodic forgiveness of farm loans. To improve their lives, farmers need a way out of agriculture and into the manufacturing or services sector. In fact, most small-scale farmers would happily sell their land if only they could be provided alternate employment. The main source of India’s developmental failure since 1947 has been its inability to move the huge mass of people involved in agriculture into industry and the services sector. As the share of agriculture in the national output falls, any crisis hurts those dependent on agriculture disproportionately. A decade ago, the government embraced the global marketplace and began cutting farm subsidies as it liberalized what had long been a managed socialist economy. The farmers’ costs rose as the tariffs that had protected their products were lowered. Many farmers switched to new genetically engineered cotton seeds which are resistant to a deadly pest called ‘bollworm’ and produced far higher yields and healthier crops with less use of pesticides. The seeds can be more productive and became standardized in many regions of Maharashtra. However, they can be three times more expensive to maintain than traditional seeds. Years of market-oriented reforms have unleashed a wave of capital and entrepreneurialism across India. But despite high-end sectors such as information technology making impressive strides and adulatory portrayals of India at home and abroad as an economic juggernaut, the benefits of reform have yet to extend to the hundreds of millions who toil on the land. The government has slashed or phased out subsidies for some crops, shredding a key part of the safety net. The result is a growing social crisis. Peasants borrow loans from moneylenders at exorbitant rates of interest in order to buy expensive transgenic seeds and high-cost fertilizers that allow them just to feed themselves and their cattle. They hope for better yields in the future, but this time never quite comes. Eventually, many farmers find themselves in a debt trap as they keep pursuing the vain mirage of a golden crop bonanza. Owing more than they earn, the steadiest of these workers have become gamblers at the highest of stakes, betting their land and their lives on a better crop. As debt mounts, many farmers are now taking a permanent escape from the physical and emotional pain by ingesting deadly pesticides. Economic reforms and the opening of Indian agriculture to the global market over the past two decades have made small farmers vulnerable to unusual changes and fluctuations. The small farmers must now compete with the larger industrial farms, which are well-endowed with capital, modern irrigation and supplementary businesses to buffer them against any adverse market shocks. Small-holding farmers are now faced with what has been called a “scissors crisis”, which is driven by rising costs without a commensurate increase in output value. For smallholder farmers, expenses are heavy in the season before the planting while income arrives only several months later with the harvest. These farmers need cash to plant their crops and, more importantly, to feed the family between harvests. Access to credit — and, thus, access to seeds, soil nutrients, extension advice, improved technology and equipment, — alone can help them. The main products of many microfinance institutions – short-term working capital loans with frequent repayments –are not well-suited to seasonal or longer-term agricultural activities. The Green Revolution was a success, but it came at a heavy price. It relied on high-yield seeds, fossil fuels for fertilizers, modern methods of plant breeding and the massive use of pesticides and equipment. A heavy dependence on irrigation led to large-scale water mining. This did increase agricultural productivity for a time but it also depleted the soil and consumed far too much water. The Indian states that were the front-runners during the Green Revolution now suffer from soil degradation, groundwater depletion and contamination along with declining yields. The Green Revolution had four leveraging — high yielding seeds, intensified use of chemical fertilisers, increased acreage through double cropping and intensified irrigation through deep bore wells. We now are confronted with a somber question: Can agriculture be leveraged unmindful of nature’s grammar and the prose of land-labour dynamics? Dr MS Swaminathan, who pioneered the Green Revolution, and other nutrition experts are calling for a dramatic shift in the approach to agriculture. They argue that, instead of industrial-scale, high-tech agriculture, farming should become closer to nature and involve intelligent plant breeding and a return to old crop varieties. “Formerly, the farmers were depending on 200 to 300 crops for food and health security,” says Swaminathan, “but gradually we have come to the stage of four or five important crops, wheat, corn, rice and soybean... The Green Revolution did not eliminate hunger and malnutrition.” Today, Swaminathan speaks of an ‘evergreen revolution’, which combines the best of both high-tech and environmentally sounds agricultural practices. Vandana Shiva, a prominent opponent of modern agricultural engineering, is calling for a return to diversity in agriculture. “Most of our traditional crops are full of nutrients,” she explains. Farmers who have made the switch to modern corporatized agriculture, she explains, give up their traditional seed only to be forced to buy the commercial varieties, which often come with license fees in perpetuity. She recommends field crop-rotation, and the fostering of vegetable and fruit gardens and small family farms primarily geared toward nutrition instead of maximized profit. Crop rotation techniques ensure that no single botanical crop family has predominance in the rotation, hence pests do not build up as they tend to be specific to certain crop families. There is an inextricable link between smallholder farmers and the health of our planet, just as there’s a link between us and these smallholder farmers. They play a highly critical role in protecting our environment. Many small holder farmers lack the resources they need to sustainably cultivate high-yielding, nutritious and marketable, and crops. The pressure to feed their families and sell their crops to pay off other debts means the soil is often overworked. These farmers have to be taught smart agriculture practices, like harvesting rainwater, using organic fertilizers and undertaking intercropping to preserve their soil, and more resources like small farm loans, real-time weather and pest updates, and information on accurate market prices for their crops can help make them the most of their farms year-round. A crop failure, an unexpected health expense or the marriage of a daughter are perilous to the livelihood of these farmers. An adverse weather change, for example, can lead to a drastic decline in output and the farmer may not be able to recoup the costs of planting. Sometimes, farmers have to attempt to plant seeds several times because they may go to waste by delayed or excess rain. The problem has depressed yields and rural consumption nationwide -- a heavy economic drag on a nation where two-thirds of the population still lives in the countryside. Small and marginal farmers also do not have access to institutional credit. Most of them depend on village moneylenders, giving them loans to cover the costs of planting and feeding the family in the expectation of future crop sales. Credit histories and collateral may serve to qualify middle-class customers for loans, but most rural smallholder farmers have neither. Small farmers also need to revive some traditional farming practices that have been lost in the rush of new technology. Land leveling, mulching, and crop diversification are all practices that improve soil health and reduce the excessive spending on fertilizers and chemicals. These inexpensive practices help to preserve soil nutrients, prevent erosion, suppress weeds, and increase fertility. Crop residues that are generally burnt in the field - which contributes to local air pollution—can be used productively as mulch. Also, there would be no need for expensive diesel gensets for tube wells if farmers adopted proven irrigation technologies, such as the drip-and-sprinkle method. The National Sample Survey Office (NSSO) makes another hard revelation; the bloated debt of Indian agricultural households has increased by almost 400%, while their undersized monthly income has plummeted by 300%. Unsurprisingly then, the number of heavily indebted households increased steeply during this period. The report, Situation Assessment Survey of Agricultural Households in India, is based on a countrywide survey of nearly 35,000 households by NSSO (70th round) for which data was collected on the agricultural year spanning July 2012 to June 2013. Most farmers have become victims of the endemic phenomenon of a downward slide on the social ladder, by which the farmer became a sharecropper, then a peasant without land, then an agricultural labourer, and then is forced off the land. Social mobility for farmers is becoming an unrealizable dream. A prudent and effective strategy for small farmers is to form clusters for mutual self-help where those growing the same crops can come together in organized groups to receive joint training, buy in bulk and sell their produce as a single body. Organizing smallholding farmers into groups is a key component of strengthening this part of the agricultural sector because of the confidence, support and market power such organizations can provide. Despite their huge overall numbers, small farmers are not a solidified group and have not developed their negotiating power. According to Ashutosh Varshney, professor of International Studies and the Social Sciences at Brown University, social divisions among the rural population have been the main reason why India’s rural voters have failed to push for policies that boost rural incomes. Varshney argues that the large size of this population and its heterogeneity limits its influence on public policy. Farmers’ refusal to give precedence to their economic interests over their other ethnic and caste loyalties have limited their influence over public policies. However, the government can still make important progressive interventions. Certifying seed and making such seed more available can ensure that money is not lost buying fakes. The government should also provide proper modern storage so that crops do not end up rotting before they reach the market. Complementary investments in transport infrastructure, irrigation, and farmer credit were essential to Asia’s 20th-century green revolution, which laid the foundation for the region’s subsequent economic breakthrough. The same basic approach, updated for today’s new social and environmental realities, can help to restart the progress in rural India and spread the economic revolution to the poorest parts of rural Africa. The government needs to revamp its services so that farmers have access to latest technology and field practices. The agricultural universities must be involved in creating tailored educational programs that serve the diverse needs of India’s rural population. Small farmers need to learn how to work with limited land in a productive and environmentally friendly way. They do not only need better plant species but also up-to-date guidance on how to grow them. They do not need high-tech tractors controlled by satellites, but they do need access to regional databases that provide information on soil quality. They also need access to affordable capital so that they no longer pile up unmanageable debt loads. The formalisation of land titles and access to credit are tightly connected. Holding access to land provides an incentive to make investments, and increases the ability of the poor to access credit. The problems of small farmers are complex and require a steely political will to be properly addressed. Their landholdings are below the threshold that is economically viable. The result is a cycle of bad loans and bad harvests following poor rainfall. Loan waivers have little role in ending the conditions that lead to such problems. Secondary value addition facilities such as groundnut shelling, dal milling, cotton ginning, fruit pulping, rice hulling milk chilling, etc. The risk levels of farmers need to be mitigated through watershed development soil and water conservation measures, installing protective irrigation and by using appropriate agronomic practices all the way from ploughing techniques to seed selection and timely farm operations. In the case of livestock rearers, risks can be reduced by proper herd management practices and mass vaccination for against simple ailments like foot and mouth disease which are very common and are responsible for large mortalisites. It these type of investments can reduced the risks in farming and improve the returns on private private investment . “For the world’s poorest farmers, life is a high-wire act – without safety nets. They don’t have access to improved seeds, fertilizer, irrigation systems, and other beneficial technologies, as farmers in rich countries do – and no crop insurance, either, to protect themselves against losses. Just one stroke of bad fortune – a drought, a flood, or an illness – is enough for them to tumble deeper into poverty and hunger…. The world’s poorest farmers show up for work each day for the most part empty-handed. That’s why of all the people who will suffer from climate change, they are likely to suffer the most”. The country’s first Prime Minister, Jawaharlal Nehru, said in 1947, “Everything can wait, but not agriculture.” However, what India is witnessing today is exactly the reverse. While all the other sectors of the economy are surging ahead, agriculture is the only one which is on the decline. Within this self-perpetuating cycle of rural misery, wrapping a noose around the neck is the all-too-easy exit for an increasing number of smallholding farmers. While these deaths might bring about a personal escape for some, they leave behind crippling emotional, financial and physical burdens for society. Small farmers need to be convinced to form co-operatives and avoid middle-men. Also, having large families mean breaking up the already small plots into still smaller ones--this is the most difficult problem to tackle; the farmer argues that he needs hands to help him and he cannot afford to hire help--here the co-operative would help as they could also lay down rules for inheritance and set a standard for wages to be given to hired hands.